Wind power couldn’t keep up with my burgeoning metropolis, so I decided to go hydro! How hard could it be to build a dam? Turns out, it isn’t easy. I had heard it was challenging, so I saved my game before the first attempt. 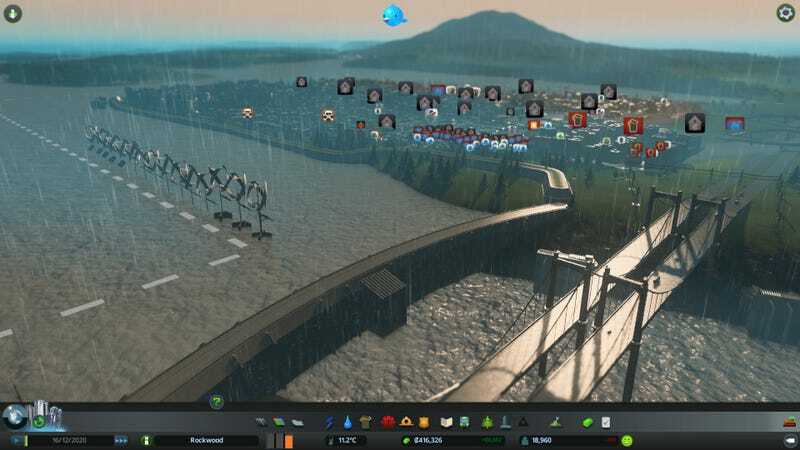 The east side of my city (residential zone) promptly flooded. Built a quay and flood wall to keep the water out, worked great. Had some unforeseen flooding on the neighboring peninsula, but I hadn’t built there yet so no big deal. Some water got past the end of the flood wall and got some homes on the south side a little wet, but it ran off quickly. The night came and the rain started. On the west side, water began to creep into the industrial district. I figured it’d just run off again. I was very wrong. Within five minutes the water had spread from the industrial sector to cover the entire city. The only buildings that weren’t under water were the high rises and people began to flee by the hundreds. It was over. The water had won. TL;DR: Building cities is freaking hard.